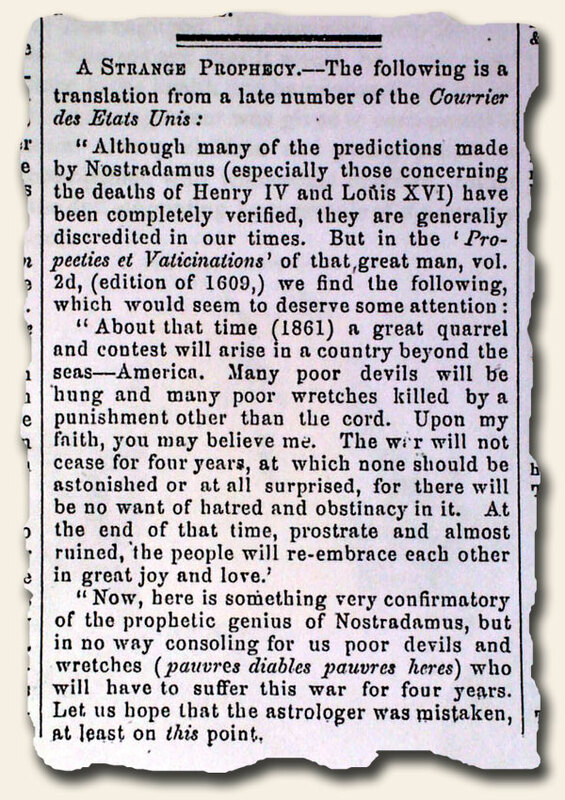 The “Stockton Daily Independent” newspaper of Oct. 28, 1861 includes an article headed: “A Strange Prophecy” concerning Nostradamus & the Civil War. In 1609 he predicted: “…About that time (1861) a great quarrel and contest will arise in a country beyond the seas…The war will not cease for four years…” and more (see). Keep in mind it was in 1861, just 6 months after the start of the Civil War, that the write noted: “…in no way consoling for us poor devils and wretches…who will have to suffer this war for four years. Let us hope that the astrologer was mistaken, at least on this point.” (see) But the prediction would be true. The Civil War would run almost exactly 4 years after its beginning.